I don’t know whether it’s the warm salads or the fact that it’s light outside until 5 p.m. now (holy cow!!! ), but I feel that February is going by very quickly. Thank goodness for that, I want spring! The next delicious dish on the menu is a warm cabbage salad, adapted from 101 Cookbooks, and packed with all kinds of flavour layers. Sweet, sour, woody, salty, rich and clean – we’ve got them all on one spectacular plate of whole food goodness. In fact, something about all of these rich colours and contrasting textures reminds me of a walk through the forest…with just a dash of snow. 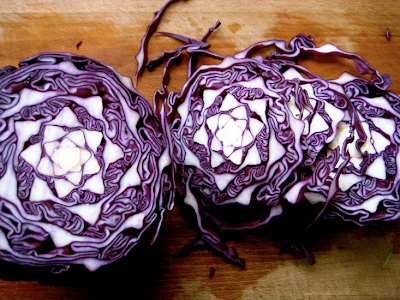 The star of the show here is red cabbage, a veritable powerhouse vegetable, often underappreciated and misunderstood. I think this boils down to the fact that cabbage is often either over-cooked and mushy, or when eaten raw, sliced into too-big chunks and not fun to munch – we’re not rabbits after all (although I would bet that I was one in a past life). In this recipe, the cabbage is sliced into thin ribbons and heated just through, so that it retains some of its distinctive crispness. When tossed with a dark balsamic vinegar, it becomes sealed with a juicy sweet-tartness that deepens as the flavours sink into the slivers of its purple splendor. Too much? Like I mentioned earlier, cabbage is a vegetable with crazy health-promoting powers. In fact, it was written up in the New York Times health column: “The 11 Best Foods You Aren’t Eating”. Convinced yet? I hope so. 1. Heat the olive oil in a large skillet and sauté the onion for a minute or two with a couple pinches of salt. Stir in the garlic, and the cabbage, and a few more pinches of salt. Stir and cook for just a minute or so, or until the cabbage softens up just a touch. 2. Then stir in the rosemary, most of the raisins, and the vinegar. (The cabbage will continue to get more and more tender even after you remove it from the heat, so keep that in mind, and do your best to avoid overcooking it – where it collapses entirely). Fold in half of the goat cheese, the apples, raisins and walnuts, then taste. Season with more salt if needed. 3. Serve garnished with the remaining raisins, goat cheese, and walnuts, and perhaps a sprinkling of rosemary sprigs. To make a complete meal, serve this salad on a bed of wild rice, adding to the overall “woodsy-ness” of it all. For vegans, omit the goat cheese and throw in more nuts. Just made for a potluck dinner and was a big hit. Loved the blend of flavors! The addition of rosemary was wonderful! I’ve remade this salad many times over the past few weeks for myself and clients… loved it! Oh my, this salad is phenomenal! I made it the third time this week, I guess I have to admit – I am obsessed! Thank you so very much for this awsome creation! I forgot to mention: I got an a-ma-zing elderberry balsamic vinegar recently and it turned out soooooooo awesome in this recipe 🙂 Cheers! Hi Sarah! I want to thank you for this great recipe, I made it tonight and my boyfriend and I really enjoyed it. I got a delicious truffle goat cheese to go with it — it was wonderful! I’ve been seeing an acupuncturist and have been told to eat less raw foods and more cooked vegetables to help with my digestion. I was so pleased to see that your site has several warm salads, can’t wait to try them all. Also, thank you for providing so much nutritional and health information along with your recipes. This feature of yours makes your blog one of my favorite food blogs, I love how educational your posts are. Keep ’em coming. You are a very gifted chef! Thanks Sarah, one of my all-time favourite recipes from your blog – it was a smash hit at christmas and I eat it almost every week during winter. I prefer it without balsamic vinegar and raisins, substituting with a little bit of lemon juice. I tried the same recipe from 101 cookebooks and loved it. I’m going to give your revised version a try as well. Sending my love from TO! Thank you so much for all your hard work! You rock! this looks so yummy! definitely going to try it!